The eyes are the windows to your soul. But what if you are afraid to show your soul because of the dark bags under your eyes that make you feel embarrassed and self-conscience? Don’t worry too much, for every condition there is a remedy, and getting rid of dark circles is not difficult with the help of some natural methods and the best beauty products. The best way to get rid of dark bags under your eyes is to find out what causes it and remove the source. When puffy eyes can have several causes starting with lack of sleep, to crying, to poor diet, to stress, dark circles have a whole different reason behind them. Dark bags or circles under eyes are the result of oxygenated blood that is gathering under the delicate skin around our eyes. Since the skin here is thin and somewhat transparent, blood glows through making the skin look blueish. This can be especially noticeable in the morning after waking up since we have been laying in a horizontal position for a long time allowing fluids to accumulate in the veins. Young people usually have some fat under their skin, making the dark tone less visible, but as we grow older, the problem becomes more noticeable. There are a lot of remedies and treatment options for this problem, however most of them only work for a day or two. The first thing you should do is to change your lifestyle. If you keep eating unhealthy foods that are full of fats and sugar, you will have a really hard time losing those annoying dark circles. But if you think about your health, start eating better and also working out, you will soon see improvement in you skin. Also, try to get enough sleep and avoid stressful situations. This way you will get results in a while. But until your lifestyle changes take effect, here are some quick remedies to fix you up for the day. Cucumber slices. 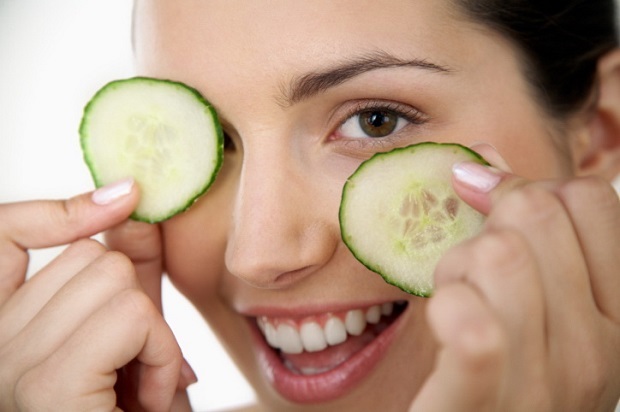 Place cucumber slices on your eyes to refresh the skin and take away the puffiness. Do this every day before leaving for work in the morning and your eyes will look much better. Tea bags. Tea bags have tannin in them that reduces discoloration and swelling. Lie down and relax while keeping damp, cool tea bags over your shut eyes for 15 minutes. Potato. Take a fresh potato and either crush it in a blender or just cut into two halves and place on your eyes. Hold it there for 30 minutes and remove. This works for many people, but not all. Spoon. Place a spoon in the freezer until it is cold and frozen. Hold it on the dark bags and massage gently. Replace the spoon when it gets warm. Keep doing this for 15 minutes, you will see instant improvement.